You said “Stand straight and elongate your spine, lifting your head up. Of course, you don’t want to make it so you are uncomfortable.” One way to help with that is to borrow from The Alexander Technique: Looking at your picture on the right (labeled ‘Good Posture’), notice where the vertical line comes out of the head (in the picture). Gently tug on a lock of hair at that point and watch your body straighten out into the Good Posture position. After a while you will learn to stand straight without the tug on the hair. I mention this because people with one leg shorter than the other, or chronic bad posture for other reasons, often can’t tell that they are not standing straight. This can help you get there. 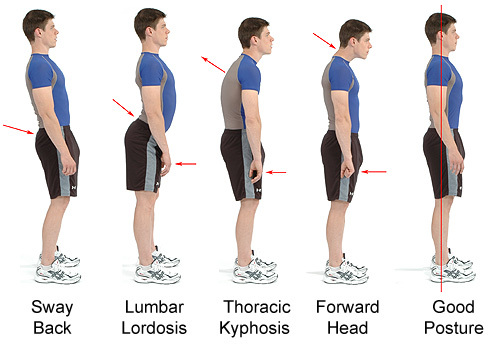 Thoracic Kyphosis and Forward Head typically* can be helped with this technique. Sway Back and Lumbar Lordosis may be helped by this, but both are more likely due to skeletal problems making Good Posture extremely difficult, or even impossible, to achieve. *Any of the poor postures can be caused by other factors, hindering any technique from working completely, but usually any of these issues can be improved by _better_ posture, hence by this technique.